NHK's 49h taiga drama centers around Ryoma Sakamoto (January 3, 1836 - December 10, 1867) a leader of the movement to overthrow the feudal regime of Tokugawa shogunate. Ryoma Sakmoto is thought to have been a visionary who helped spur Japan to modernization. precious Nov 08 2015 6:58 am I usually watch a short series or SP, but this taiga drama made me watch and finished 48-episodes. 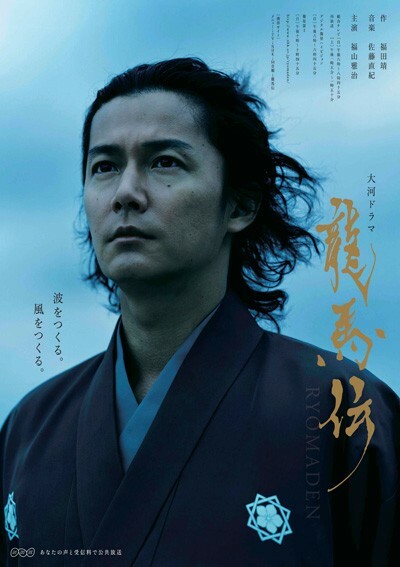 got addicted and interested in Sakamoto Ryoma`s history, all the cast were excellent! so proud of this jdo. saikou. carolinarsy Sep 18 2015 9:21 am I love this drama. All character play well in this drama. Especially masaharu who played sakamoto ryoma and the famous hitokiri kkada izo who played by sato takeru. Harley Sep 03 2012 6:56 pm I really like the character Ryoma Sakamoto and the actor Masaharu Fukuyama, and I thought that the drama of Ryomaden the Legend is just a fiction but actually it is not. Harley Sep 03 2012 6:50 pm I am from Brunei and I really like to watch Ryomaden the Legend. It is the best drama ever. Tai Takada Feb 05 2011 9:07 am I really think Teruyuki Kagawa should be placed in nomination at the 日本アカデミー賞, Nippon Akademī-shō for his role as Yataro. At least at the Television Drama Academy Awards. At first it was a big turn off with his shouting and general grumpiness, but just like the drama itself his role grew and became very good once the Nagasaki story unfolded. Has anyone heard if NHK's(Japan Broadcasting Corporation) Head Fumio Narashima is pushing Ryoma Den in the advertsing for awards. Anne-Sophie Jul 13 2010 2:24 am I think it's Usuda Asami, an actress from Amuse Agency. She played once with Sato Takeru as one of the four Sole students, in Mei-chan no Shitsuji. jake Jul 12 2010 12:16 pm Who is the actress that plays natsu i think she's izo's love interest in the the drama?